I thought I was lucky to get the following products to try out! According to Surya Brazil – Made with Amazonian Organic ingredients and 100% natural exfoliants from Coconut bark and organic Buriti, which remove dead cells and impurities. Amazonian White Clay enhances the exfoliation power, and a high concentration of organic Aloe Vera juice provides intense hydration. It leaves skin silky, smooth, soft and hydrated. No ethyl alcohol, sulfates or silicone. 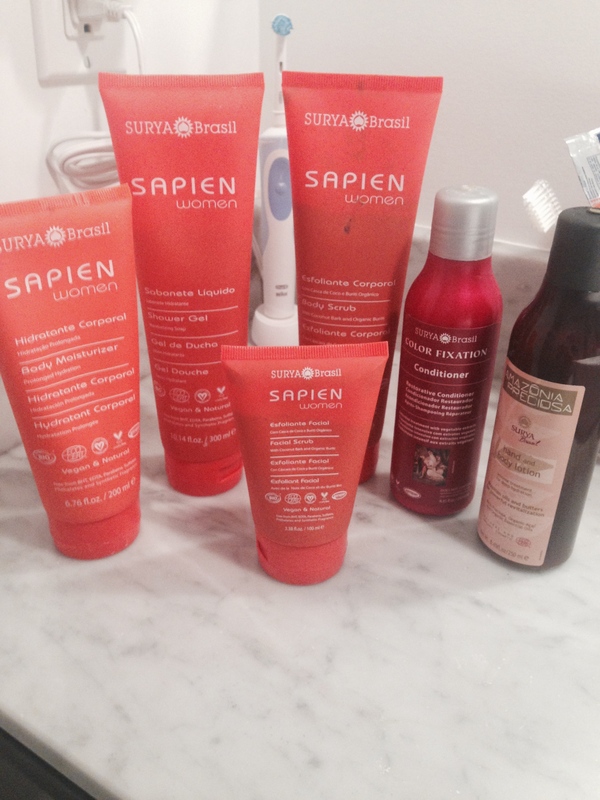 For best results, follow with Sapien Women Body Moisturizer. For all skin types. According to me – I really liked that it’s all natural. It is a very light/gentle scrub which means that you can probably get away with using it 2-3 times per week. What I don’t like is how much of it you have to use … and it globs like mud (and looks like mud) so your shower is a mess after. It also smells terrible. According to me- My initial thoughts was that it would be great for those wary of doing facial scrubs at home. However, after a couple weeks my skin started reacting and I got hives on my FACE. Urgh I don’t know if the product went bad or what but I would avoid this one. According to Surya Brazil-The ecofriendly Sapien Women Body Moisturizer is vegan, natural and rich in exotic organic Amazonian ingredients like Cupuaçu and Murumuru butters, Pracaxi and Açaí oils, Amaranth protein, Vitamin E and Aloe Vera juice that protect the skin and provide deep hydration. Promotes healthy, long-lasting moisture and soft skin without leaving it greasy. No ethyl alcohol, sulfates or silicone. According to me- Very nice and light moisturizer. Perfect consistency for the summer when I don’t need a crazy heavy moisturizer. It does smell terrible though so I definitely won’t be using it. Also after it was opened for awhile it started to progressively smell worse . Again I don’t know if it went bad or not. According to Surya Brazil-The ecofriendly Sapien Women Shower Gel is vegan, natural and rich in exotic organic Amazonian ingredientes like Pracaxi oil, Aloe Vera juice, Amaranth protein and Vitamin E, which protect skin and provide deep hydration. According to me- I hate this product. Needed so much to get a lather, I hated the smell and I started to get a rash from using it. In summation I am not a fan…which is sad because I really wanted to be. I think the products have a really short shelf life (ridiculously short even for natural products) but I can’t say for sure because there are no expiry dates (RED FLAG). This isn’t a cheap line – it’s actually pricy so my advice is to save your pennies for better quality. This entry was posted in Beauty and tagged body scrub, conditioner, face care, facial scrub, Hair, hair care, moisturizer, shower, shower gel, skin care, surya brazil by maldham. Bookmark the permalink. Ummmm ewww. Thanks for this, I will pass on Surya.